One Lucky Day: For the Love of ....Labels? 1. Have you been to Staples lately? I made a visit there over the weekend to see this...Martha Stewart's new line with Avery. Enough to make a girls heart swoon. 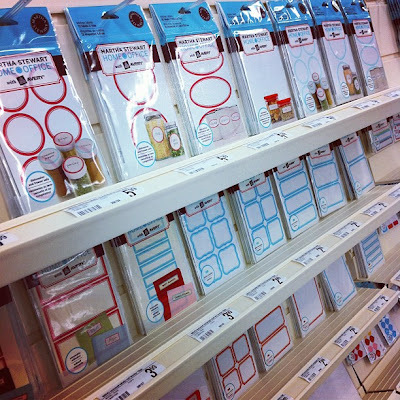 My husband said, "I now know what to buy you for Valentines Day...a bunch of labels." There were so many shapes and sizes! The more I looked, I realized there were different kinds of labels. My husband kept joking he could hear angels singing. He finally just sat down in an office chair and played Solitaire on his iPhone. Maybe I should have got a picture of that. These are dishwasher and freezer safe. Love that idea since I store many kinds of nuts for baking in the freezer. Currently I use a Sharpie on the plastic container for the name and date yet I still have a hard time reading it when the nuts are added to the container. These labels will solve the problem. 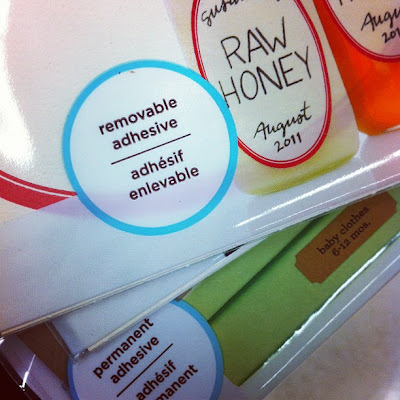 How about removable adhesive? again, solves a problem (I hate soaking and scratching the label off the glass jar once the contents are used) and in a classic style. 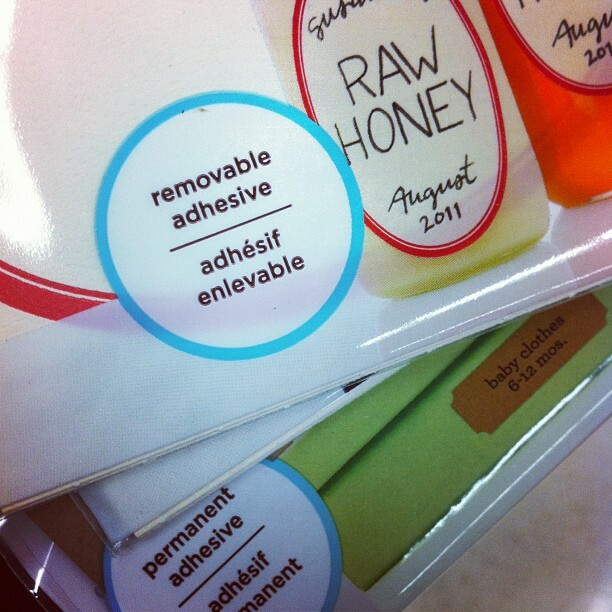 There are also other types of labels. 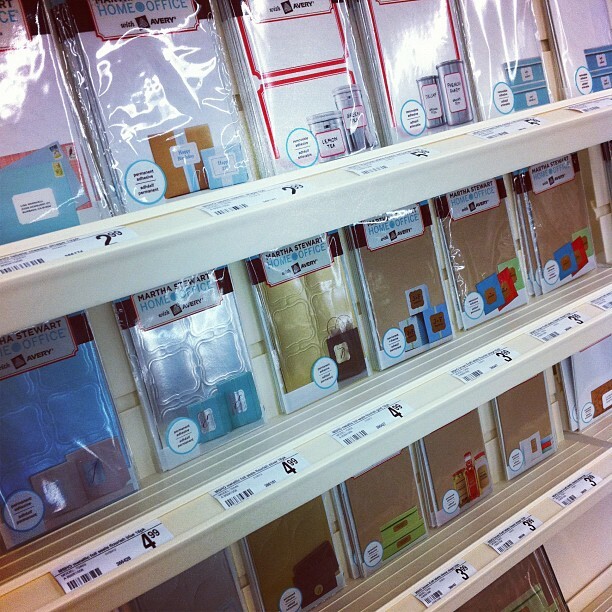 There are also notebooks and office supplies, but they are not as cool as the labels. 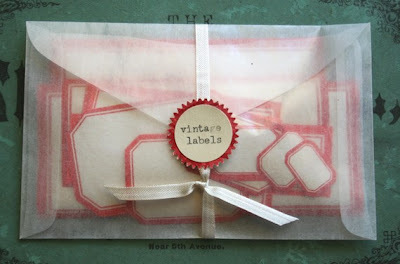 If you would rather have vintage labels for certain projects, be sure to check out Julie Collins Etsy shop. She has so many lovely things as I am sure many of you have purchased from her before. Her packaging is always impeccable and you know how that always gets me. I had the pleasure of meeting Julie for the first time at CHA as she sat at the table to write an order for a few things from 7g. ...and of course we talked about packaging. 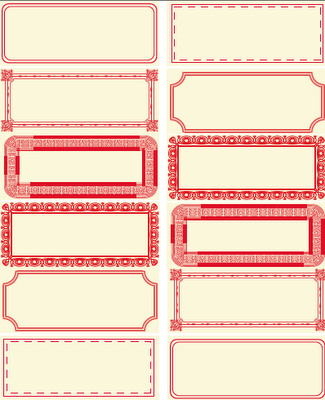 Poppytalk (love the Poppytalk blog) has a free printable if you are into printing labels yourself. Just click on the link and download from their site. Super easy. When you're working and your tired. Not admitting anything...just saying it's not a good set up. Can't wait to run to Staples - thanks for letting us know. I love labels! Thanks for the info on the labels...I have not seen these yet. And LOL on the yogurt and glue...totally something I would do!! I have label love too! Thanks for the tip...off to Staples. Is there anything that Martha Stewart isn't in the middle of? And how did the "yogurt" taste!?!! Lol! This is too funny! I was just telling myself, I need some labels since I'm running low.. Ty! Thanks you for all the links for labels. I guess a trip to Staples is in order, too! I hadn't been to Staples lately, but the funny thing is, I participated in a consumer research study last year about Martha Stewart office products. 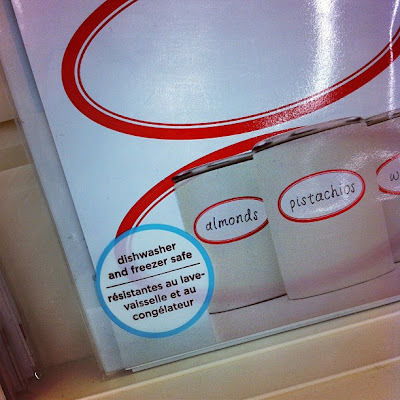 I was with 5 other women, we gave our opinions about packaging, the labels themselves, colors, etc. I'm glad you are excited about the result! Ooh I love a good label! So, does multi medium taste like the paste we used to use as kids? Ok love this post! too funny! Love the lables will have to stop by and check out the fabulous labels!!! I was at Staples this evening and saw the Martha products. Too bad I had a time limit or may be it was good I had a time limit! So, what does primer taste like? Or does yogurt prime? Thanks for the reminder..I read about it, forgot about it. Will be fun. Love the Hubby thing thank goodness for phones!! and their games. I took a big ol' gulp out of my paintbrush cleaning water a little while back instead of my "regular" drinking water. Blech! I guess I need to go to Staples! Love those vintage labels. I've always said I appreciate good packaging. It's worth the cost of the gift. You are far too funny :) I totally appreciate the label thing. I often stand and look at things with longing in my eyes while my husband rolls his eyes and shakes his head. Thanks for all the label links. Laughed at yogurt pic...too funny. otherwise i would dash over there in my slippers just to see the label loveliness. can't wait. thanks so much for the lovely compliments~ i'm just about grinning ear to ear. Multi medium and yogurt, its a good thing! Will also have to check out Staples. Thanks!